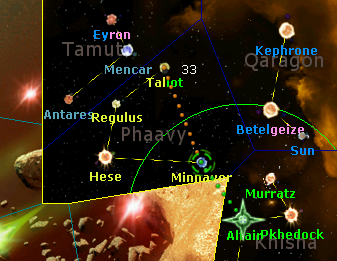 Tallot boasted a military base, and looking through the advanced weapons had me salivating for the front lines. 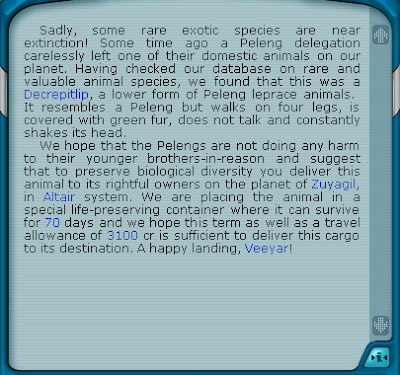 All were way too heavy for my crate, so headed over to complete the delivery run. The Pelengs were delighted to receive the trophies and were not just waiting for the rainy season to start to get the "campaign" underway. 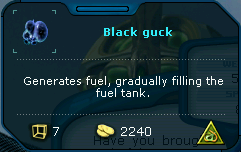 They also presented me with some Black Guck, a wierd substance that emits fuel continuously. Such an appropriate gift. 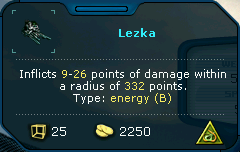 Looking through their components on offer I stumbled upon a new type of long range laser; a Lezka. It delivers much more damage too, so it will make an ideal replacement for one of my Mining Lasers. It weighs more, but I have a little leeway in that regard compared to mounting points. In fact another Lezka would be perfect if I can get it as light as this one.